Crust Gourmet Pizza Bar - Essendon uses their own specialised couriers to deliver their food. Freshly diced tomatoes, Spanish onions and feta on a tomato base topped with fresh basil and balsamic glaze. House cooked beef bolognese, bacon, garlic and basil served with shaved parmesan and fresh herbs. Made with house cooked linguine. Prosciutto and wild mushroom medley with parmesan and garlic blanco creme sauce, served with shaved parmesan and fresh herbs. Made with house cooked linguine. House cooked gnocchi tossed with fresh goats cheese, lemon and wilted baby spinach, garnished with lemon zest, served with shaved parmesan, fresh herbs and a lemon wedge. Slow cooked pulled pork, purple cabbage, shiitake mushrooms and egg on a garlic oil base, topped with hoisin aioli and sesame seeds, garnished with chopped red and green chilli and a lemon wedge. Chunky mushrooms marinated in tandoori spices, diced tomato, Spanish onion and roasted capsicum on a tomato base, topped with mint yoghurt, garnished with coriander and fresh chopped chilli. Sourdough loaf with herb and garlic butter topped with polenta (vegan friendly). Garlic squares topped with fresh herbs. Caramelised onion and goats cheese on a garlic oil base, drizzled with balsamic glaze and finished with fresh thyme. (Topped with 100% Australian mozzarella cheese). Caramelised onion on a garlic oil base, topped with a fig and date reduction, drizzled with balsamic glaze and finished with fresh thyme. Succulent, sticky pork ribs marinated in our signature bourbon BBQ sauce, served on a bed of rocket. Wagyu beef, wild mushroom medley, caramelised onions on a béchamel base garnished with fresh parsley and basil, topped with authentic buffalo mozzarella and black truffle aioli. House cooked lamb roasted in aromatic spices, Spanish onions and baby spinach on a tomato base, garnished with mint yoghurt and lemon wedge. Twice cooked shredded pork and caramelised onions on a BBQ base topped with fresh pear, Vietnamese slaw and garlic aioli. Marinated duck breast, shallots, on a tomato and hoisin base, garnished with sesame seeds, fresh chopped chilli and dressed with orange glaze. Served with a side of cucumber, shallot and coriander slaw. All pizzas topped with 100% Australian Mozzarella Cheese. Low Carb (9"), Medium (11"): 2 serves, Large (13"). House cooked chicken and shallot, on hoisin, sweet chilli garlic and tomato base. Garnished with slaw, fresh coriander, chilli, and coriander aioli. House cooked chicken, thinly sliced prosciutto, Spanish onions and tomatoes on a tomato and garlic base. Garnished with fresh avocado, wild rocket and pesto aioli. House cooked chicken, roasted capsicum, caramelised onions, shallots, and bocconcini on a tomato base, and topped with peri-peri sauce. House cooked chicken roasted in tandoori spices, shallots, and crushed cashews, on a tomato base and topped with mint yoghurt. House cooked chicken, mushrooms, Spanish onions, and shallots on a BBQ base. (Feta optional). All pizzas topped with 100% Australian Mozzarella Cheese. Low Carb (9"), Medium/Gluten Free (11"): 2 serves, Large (13"). House cooked lamb roasted in Mediterranean spices, tomatoes, green capsicum, Spanish onions, feta, and oregano on garlic infused base, garnished with a mint yoghurt and lemon wedge. Chorizo sausage, Spanish onions, roasted capsicum, jalapenos, and chilli on spicy tomato salsa base and served with fresh avocado salsa. Thinly sliced prosciutto, tomatoes and garlic on tomato base, garnished with shaved Parmesan and wild rocket. Smoked ham, pepperoni, Italian sausage, mushrooms, green capsicum, Spanish onions, pineapple, and kalamata olives on a tomato base. Smoked ham, pepperoni, house cooked chicken and ground beef, Italian sausage, and bacon on a BBQ base. Pepperoni, Spanish onions, green capsicum, house cooked ground beef, olive tapenade and garlic on a tomato base. (Chilli flakes optional). Marinated prawns, sundried tomatoes, shallots, roasted capsicum and feta. Garnished with fresh herbs and lemon wedge. Spicy Szechuan seasoned prawns, green capsicum, shallots and bocconcini on a sweet chilli base, garnished with lemon wedge and fresh chilli. Marinated prawns, scallops, mussels, sundried tomatoes, and bocconcini on a tomato base, garnished with fresh herbs and lemon. All pizzas topped with 100% Australian Mozzarella Cheese. Low Carb (9"), Medium/Gluten Free (11"): 2 serves , Large (13"). Grilled eggplant, marinated artichokes, baby spinach, roasted capsicum, mushrooms, sundried tomatoes and bocconcini on a tomato base, topped with pesto aioli. Originating in 1889, a genuine Margherita with authentic buffalo mozzarella and cherry tomatoes on a tomato base, garnished with fresh basil, served with cracked pepper and sea salt. 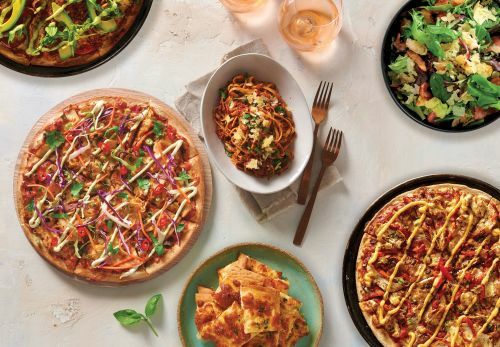 All pizzas made with vegan cheese. Low Carb (9"), Medium/Gluten Free (11"): 2 serves, Large (13"). Smokey BBQ pulled jackfruit, Spanish onions and roasted capsicum on a tomato base, garnished with vegan aioli, parsley and freshly chopped chilli. (Made with vegan cheese). Mozzarella and oregano on a tomato base. Ham, mushrooms and olives on a tomato base. Ham and pineapple on a tomato base. Ham, bacon, and egg on a tomato base. 9” pizza. Ham on a tomato base, topped with mozzarella. Served with a 200mL organic apple juice. 9” pizza. House cooked chicken and pineapple on a BBQ base, topped with mozzarella. Served with a 200mL organic apple juice. 9” pizza. Mozzarella and a swirl of Napoli sauce on a tomato base. Served with a 200mL organic apple juice. 9” pizza. Ham and pineapple on a tomato base, topped with mozzarella. Served with a 200mL organic apple juice. Mixed Leaves, Spanish onions, cherry tomatoes and cucumber tossed with EVOO, lemon and dressed with balsamic. Traditional oven roasted falafels, tabouli, harissa hummus, cherry tomatoes and rocket dressed with fresh lemon. Succulent oven roasted peking duck breast, asian slaw, cucumber, coriander and mixed leaves tossed in hoisin and sweet chilli, dressed with an orange glaze and topped with crispy fried shallots. Tender oven roasted wagyu beef, cashew nuts, cherry tomatoes, spanish onions, cucumber, fresh chilli and mixed leaves tossed with a thai sweet chilli dressing and topped with crispy fried shallots. House cooked Belgian waffles, dusted with icing sugar and served with your choice of drizzle sauce. Choose from pure Canadian maple, salted caramel or chocolate fudge. (4 serves) House cooked crispy, buttery pastry rolled and filled with a sticky walnut and cinnamon sauce, topped with a swirl of vanilla cream cheese icing. (Serves 2) Dessert Pizza layered with custard, mud cake, black cherries, topped with baked crumble, drizzled with berry coulis and dusted with icing sugar. Swiss chocolate, authentic Swiss cream and marbling enriched with wafer-thin yet wonderfully crunchy shavings made of noble Maracaibo cocoa. Only the very best Swiss cream and the seeds of carefully selected Bourbon vanilla pods.